Political prisoners in the Philippines launched a seven-day fast today, as members of the International League of People’s Struggle (ILPS) commemorate the International Day of Solidarity with Political Prisoners. The fast will last until December 10, International Human Rights Day. Close to a hundred political prisoners in different jails in Luzon, Visayas and Mindanao announced participation to the fast to call for their release and as a gesture of solidarity to various people’s protest actions leading to December 10. Those fasting are political prisoners in various detention centers in Metro Manila, at the Special Intensive Care Area-Metro Manila District Jail (SICA-MMDJ) and Taguig City Jail-Female Dorm in Camp Bagong Diwa, Taguig City; New Bilibid Prisons-Maximum Security Compound in Muntinlupa City; and PNP Custodial Center in Quezon City. In the provinces, fasting political prisoners are those detained in the following jails: Aurora Provincial Jail in Southern Tagalog; Ormoc City Jail, Tacloban City Jail, and Dancalan Provincial Jail in Bobon, Northern Samar and Bohol Detention and Rehabilitation Center in the Visayas; and in Valencia City Jail, Malaybalay City Jail, Gingoog City Jail, Provincial Detention and Rehabilitation Center in Misamis Oriental, and Cagayan de Oro City in Mindanao. Jailed peace consultants of the National Democratic Front are also joining the fast. Some political prisoners will also hold noise barrages and hanging of streamers as protest. These activities culminate on Human Rights Day, “as their way of highlighting the government’s practice of criminalizing political actions and filing trumped up charges against those perceived as ‘enemies of the state’,” said Jigs Clamor, SELDA national coordinator. As support to the political prisoners, various progressive organizations led by Karapatan and SELDA held picket actions today at the Manila Regional Trial Court and at the Department of Justice. The protesters first went to the Manila Regional Trial Court for the hearing of the multiple murder case against peace consultants Benito Tiamzon, Wilma Austria-Tiamzon, Randall Echanis, Raphael Baylosis, Vicente Ladlad, and Makabayan Coalition Chair Satur Ocampo. The case is considered the “mother” of all trumped-up charges implicating Ocampo et al in a supposed mass grave found in Monterico Village, Baybay Leyte. All those accused in the case, except the Tiamzon couple are on conditional bail. Joined in by Manilakbayan from Mindanao and Karapatan-Southern Tagalog, the protesters marched to the Justice Department. “This department cannot simply say they cannot do anything on these trumped up cases lodged against political prisoners,” Clamor said. “The military weaves stories with prosecutors so they can arrest and detain people who are actively defending their rights and their communities,” he added. 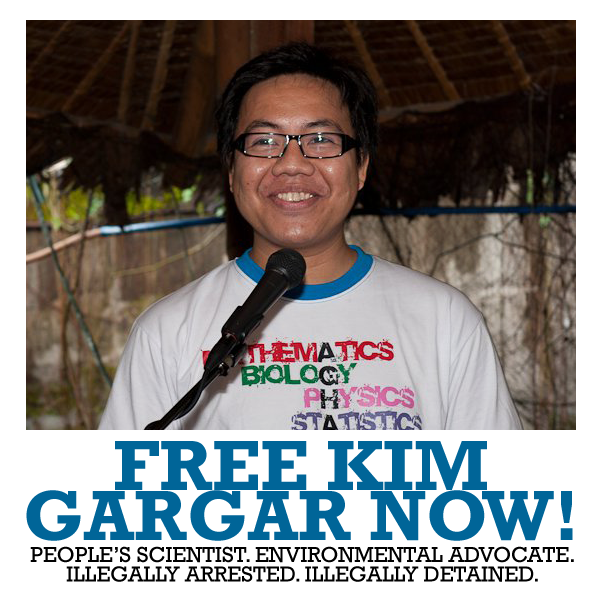 As of November 2014, there are 491 political prisoners, 220 of them were arrested under the BS Aquino regime. There are 43 female political prisoners, 53 are ailing, 42 are elderly, and six are minors.